I haven’t posted much about music and especially not lately. However, I was searching for something this week on the web and one thing led to another and here we are, posting about a trio of harmonica players. Back when I was a little kid my father liked to play records every weekend, or so it seemed. Anyway, recently I was walking out of the office and it was dark, and I began whistling the melody to Twilight Time (see the history of the song here: Twilight Time History ). The song itself is waaaaay older than I am and written in 1944 or something like that, but I always liked it. Then Twilight Time was a made famous by a musical group called The Platters back in 1958 (hear it on YouTube here: Platters Twilight Time ). Their version of the song if fantastic, but it was a different version that I remember just as well and part of the reason I never learned the lyrics. This was the one by a harmonica trio called the Harmonicats. 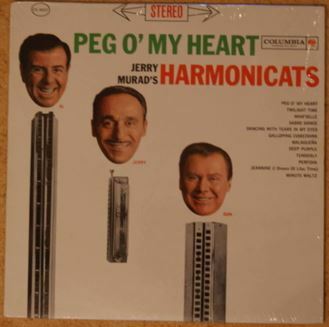 The Harmonicats began back in the 1940s (see history here: Harmonicats History ), playing some specialized harmonicas (Chord and bass versions) and not the run-of-the mill Marine Band version like I have. It was probably 1967 before I ever heard them and I would have been very young. Here is a link to their version of Twilight Time . The tune Maleguena is another I remember well: Harmonicats Maleguena and is great. If you like the sound of these harmonica players, poke around for some of the other recordings on YouTube. I especially like the ones from the LP titled, Peg o’My Heart, as that’s one of the two albums my father owned and played regularly. Songs like Perfidia, Galloping Comedians and Minute Waltz are just amazing, in my opinion. For years Lisa and I had been talking about using some of our musical instruments as art around our house and after visiting Cathy for Candice’s wedding we got motivated. Here’s the beginning result. The Orangish/Red Fender was acquired when I was 15 or so from Uncle Richard, and Dad bought the Sunburst Fender from my 8th grade guitar teacher. Both were made in 1967. I bought the American Stratocaster 8 or 9 years ago from a friend who’s wife won it at a conference in Las Vegas. She didn’t play guitar and was happy to sell it. Lucky me . . . I always wanted a Strat. Yep. Bought a banjo about a month ago. Making good progress. But . . . what a weird instrument! 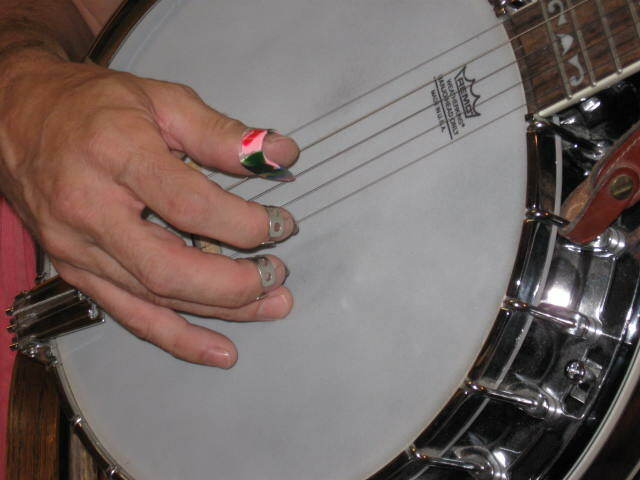 Unlike guitars, mandolins, violins and every other stringed instrument I can think of the banjo has the highest pitched string first and the lowest right next to it followed by the next three in ascending order. It is really difficult to get past my guitar/mando habits to play this thing correctly. Yep, what you see is what I got. I figured that since I know how to play mandolin and Diane has a banjo, I might as well learn how to play violin. But, get this. This thing cost just 98 bucks! Delivered to my front door. With the bow and case and rosin. Made in China, of course, and designed in Germany, I had a luthier friend of mine check it out and his words were: “I’m impressed”. I still want to get a banjo one of these days, but first . . . onward with the violin. Over thanksgiving weekend, I made a box for some audio equipment. The idea was to take the 4 pieces of equipment I like to use and put them in a box, instead of on the desk and be able to use them anywhere in the house. Included in the box are my Zoom drum machine, Behringer 10 channel mixer, Alesis MicroVerb, and Electrix Loop Repeater . . . and power of course. Now, when I can’t find anybody who wants to play some music and have a beer, I can sit in the living room, quickly record some chords and then play along with my guitar, mandolin, bass, violin, or drums. Once I got it hooked up the other day I quickly remembered how enjoyable it is to play music with other instruments. As you can see from the photo it still needs some finishing work. I bought a new music CD by Alison Brown. She is a bluegrass banjo player and was on the album New Grange. The album I bought is titled “fair weather”, released in 2000. I just finished listening to it, and it is quite enjoyable. Some good banjo, mando and guitar work there.